Heat oven to 400°F. Grease bottoms only of 12 regular-size muffins cups, or line with paper baking cups. In large bowl, beat milk, oil, yogurt and egg using wire whisk or fork. Stir in remaining ingredients except blueberries, until flour is moistened. Gently stir in blueberries. Divide batter evenly among muffin cups. Bake 16 to 18 minutes or until golden brown. Cool 5 minutes; remove from pan. Bake and freeze these muffins for an easy treat. Place cooled muffins in a resealable plastic freezer bag and freeze up to 3 months. Thaw overnight at room temperature, or reheat in the microwave on High about 30 seconds. 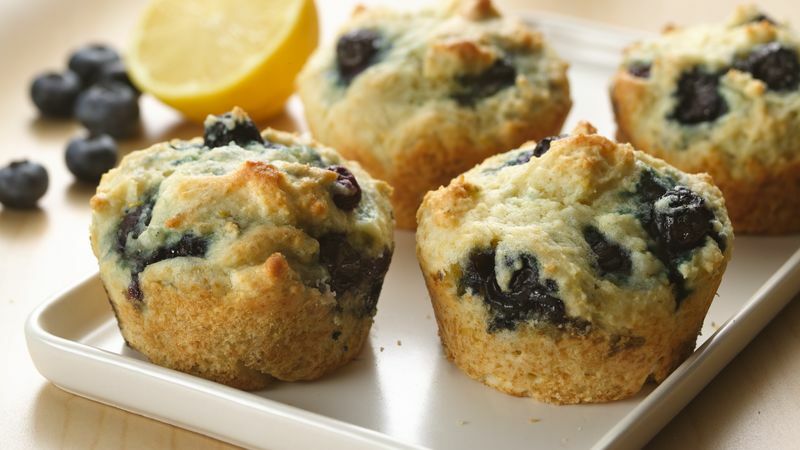 Warm blueberry muffins and cut-up fresh fruit are terrific accompaniments with your favorite egg dish.